I have 3 others and they are very good taps that don't stick shut if you don't use them every day. I already have one and they are more relaible than my Perlick. Combining w/ the self-closing spring. Tired of my other faucets sticking shut. 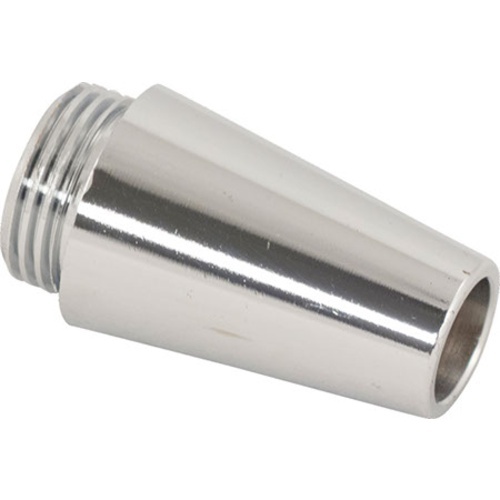 I like them they work well and the soda keg coupler works awesome with the counter pressure filler I have. Wanted to add another tap. Great performance from this brand. My old one sticks if not used for a couple of days. Will this work with a standard shank? BEST ANSWER: Hello Joshua - Yes, these fit standard shanks. It goes well with our new Jocky Box I recently built.. The Jocky Box has three taps and looks very smart and they work very well. One of four pieces purchased from Morebeer for project Party Tap. 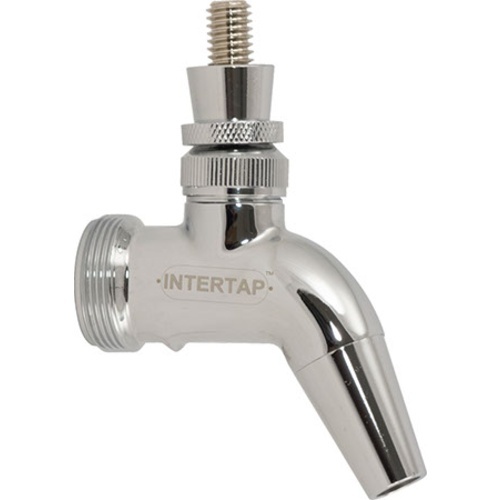 FYI the Intertap spring does work with the corney keg faucet adapter, pt#keg900. 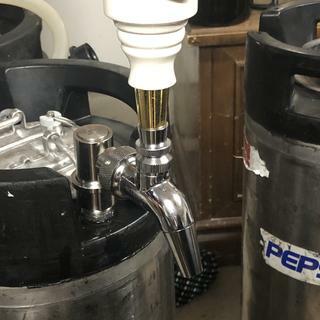 I had two taps that had complicated insides that always caused the beer to foam and clog. These taps are perfect and work very well. Works great! I did not want to spend too much for a faucet that was going to see limited use in a jockey box. This more than meets the need. We served a lot of samples at the event and it held up just fine. These taps are well worth the added cost from the cheap ones that you get with the kits. Great upgrade with the springs! So much better than the original style that came with my triple tap tower. Easy to clean. 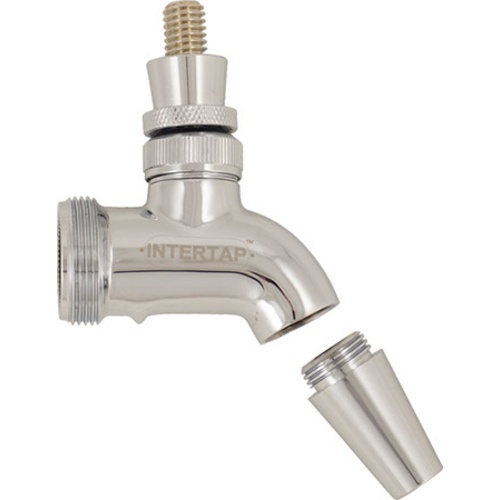 Added the P/N D1212 Intertap Beer Self-Closing Faucet Spring for a fail-safe operation. 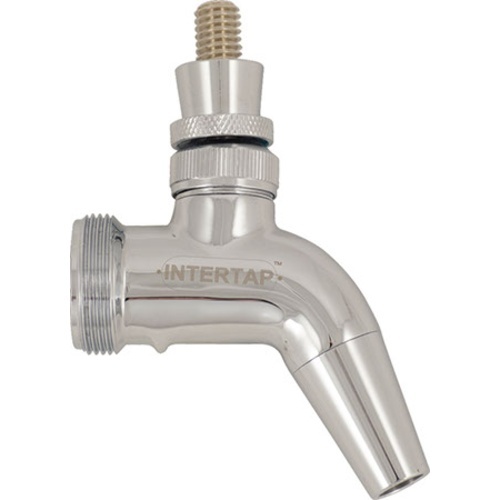 Purchased Intertap Beer faucet, very pleased with faucet thus far, work perfectly. Good value. Seem well made and solid. I bought this faucet and the soda keg spout to bottle from the faucet. It works well with both nozzles. This is a great faucet. The cost is very reasonable for a forward sealing faucet. I bought both the stout spout and the growler filler and both work very well. I like that the handle is more vertical than most faucets, making it easier to switch handles without accidentally pour beer on the floor.